In stock -This product will ship today if ordered within the next 6 hours and 33 minutes. This shampoo blends the antioxidant qualities of wild harvested seaweed with aromatic lemon aromas. A perfect balance between the green and the blue halves of our planet. 100% natural fragrance, with essential oils. Free from parabens and SLS. Aqua (Water)***, Ammonium laureth sulfate*, Maris sal (Sea salt), Polysorbate 20*, Ascophyllum nodosum powder**, Citrus limon peel oil/Citrus medica limonum peel oil*, Citrus aurantifolia (lime) oil*, Cananga odorata flower oil*, Melaleuca alternifolia (tea tree) leaf oil*, Potassium sorbate, Sodium benzoate, Citric acid*, Limonene*, Citral*. 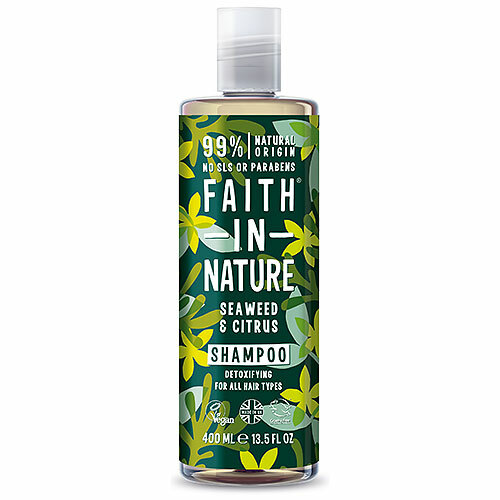 Below are reviews of Faith in Nature Seaweed & Citrus Shampoo - 400ml by bodykind customers. If you have tried this product we'd love to hear what you think so please leave a review. Excellent ...... sorted out my increasingly greasy hair from 1st or 2nd wash. Now washing at approx. 3 day intervals. Hair feels good, so no more detergents on my head. I have used organic shampoo for many years and now so pleased that I tried Faith in Nature. A little bit lathers up well, leaving my hair feeling clean and soft. The scent is subtle and pleasant. Excellent value for money. Would definitely recommend. 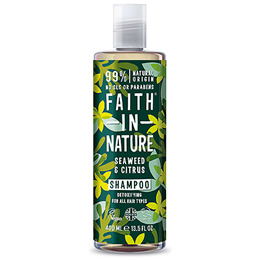 I switched to Faith in Nature shampoos in January this year as I wanted a product that was SLS and paraben free. It took a few weeks for my hair to adjust and I tried several different FiN shampoos to find the one that suited my hair (straight with a bit of frizzy kink, fine and long, gets a bit greasy at the roots but dry at the ends) best and have now settled on the Seaweed and Citrus. The scent is really lovely; clean, simple and not over-powering. The shampoo cleans really thoroughly but without feeling harsh. I have normal/greasy hair, this shampoo cleans really well (no need to shampoo twice) even after using an oil treatment on my hair. It leaves my hair shiny and light. I loved the fresh scent of the shower gel so much which is why I chose this shampoo. The consistency is just right. I've used Faith in Nature shampoos for many years, they have a wide range for all hair types and are very reasonably priced.